Over the past decade, the Park Prescriptions (ParkRx) movement has grown from an interesting concept to a valuable, holistic approach for improving health and well-being. 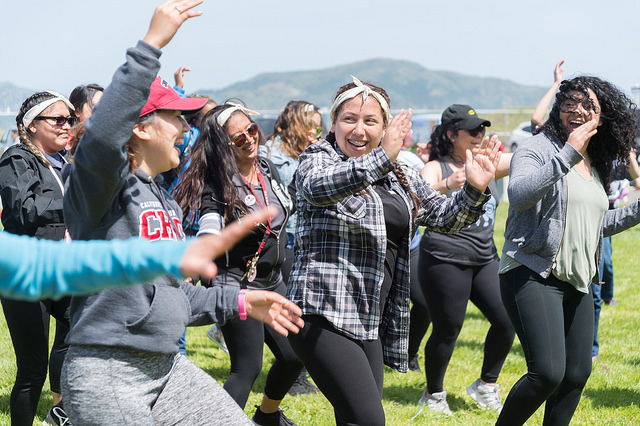 Across the nation, ParkRx programs are successfully reducing stress and anxiety, assisting with weight loss, decreasing blood pressure, and more among their participants. Now is a good time to step back and take stock of how far the movement has come and how to support its continued growth. The Institute at the Golden Gate is excited to announce that we’re spearheading this effort by conducting a ParkRx census. Our goal is to collect information on efforts that involve health or social service providers encouraging people to spend time in nature for their health and well-being. This will be the first nationwide ParkRx census of its kind and, to have the greatest impact, we aim to include as many programs as possible. All participants who complete the census by the Friday, June 20 deadline will have the chance to win one of five Amazon gift cards. Gathering crucial baseline data that will be used to better serve the entire ParkRx learning community. We want to know about the different types of programs that park and health leaders are using. Are they working with clinicians, public health educators, or case workers? Are they promoting ranger-led walks, doctor-led hikes, or outdoor Zumba classes? What data is being collected? Are they measuring changes in stress levels, knowledge of how to use the parks, or feelings of community connection? Finding all the programs pioneering this work across the nation, from Maine to New Mexico. Locating “ParkRx” programs has been challenging, partly because the definition continues to evolve. Many people doing this work may not yet associate with the “ParkRx” terminology. Our intention is to develop a common understanding that is inclusive of the diversity of impactful programs and yet specific enough to demonstrate the power of the concept. Learning from baseline data and identifying trends, emerging research questions, and lessons learned. As an example, the census might bring to light that only a small number of referring health providers are getting back patient/client data from park programs. Anecdotally, we have seen that ParkRx programs are finding greater success when there’s a feedback loop from the ParkRx program back to the health or social service partners. Through this data we can start considering these and other promising practices and, conversely, begin examining common challenges. The Institute will use the information coming out of this census to not only share basic data on the movement, but also to create evidence-based tools and resources to lift all boats. We hope that in a few years we can look back and observe that increased knowledge sharing around the ParkRx movement has encouraged more nature and health leaders to come on board and create effective, sustainable programs. If you’d like to know more about the ParkRx census or have questions, please don’t hesitate to contact us.